The Coomber Bluetooth Headphones are our top-of-the-range headphones. Connect them wirelessly to your mobile, laptop, iPad or any other A2DP Bluetooth®-enabled device and take charge of phone and Skype calls, music or audiobooks. Whether you are working out, travelling or simply walking around town, these Bluetooth headphones are designed to make it easier to listen to your favourite music while on the go or at home. Get full control over your sound with volume and playlist controls integrated on the ear cup. Experience the full benefits of sound to get the most out of your music or audiobook collection. Choose between 2 colours: white and black. Many Hours of Battery life: You can enjoy the music or wireless chat for up to days of use at reasonable volume and range. 30 Metres signal range: They allow free movement of up to a maximum of 30 metres between device and headphones. USB charger cable included: They can be charged and used at the same time or just leave them on charge until you need them. Fold them: They store neatly into a smaller size to fit into a bag or coat pocket. Integrated audio controls: easy and accessible controls on the side of the headphones. You can use these Bluetooth Headphones to Play, Pause, Forward, Rewind, Adjust the volume. 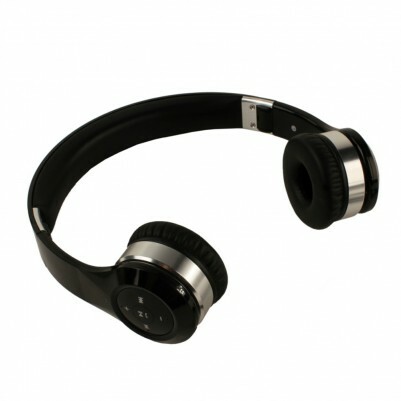 Call control: Answer phone calls by pressing the "answer/play" button on the headphones. Accurate stereo audio reproduction: The 41300 Bluetooth Headphones provide very accurate audio reproduction for a rich, clear and dynamic sound only to be replicated in very expensive Hi-Fi sets. Fashionable and Comfortable: Clean smooth uncluttered elaborate design. You can easily adjust them for your own comfort.